Hempseed oil is manufactured from varieties of Cannabis sativa that do not contain significant amounts of tetrahydrocannabinol (THC), the psychoactive element present in the cannabis plant. This manufacturing process typically includes cleaning the seed to 99.99% before pressing the oil. There is no THC within the hempseed, although trace amounts of THC may be found in hempseed oil when plant matter adheres to the seed surface during manufacturing. The modern production of hempseed oil, particularly in Canada, has successfully lowered THC values since 1998. Regular accredited sampling of THC in Canadian hemp seed oil shows THC levels usually below detection limit of 4 ppm (parts per million, or 4 mg/kg). Legal limit for THC content in foodstuffs in Canada is 10 ppm. Some European countries have limits of 5ppm or none-detected, some EU countries do not have such limits at all. The proportions of linoleic acid (LA) and alpha-linolenic acid (ALA) in one tablespoon per day (15 ml) of hempseed oil easily provides human daily requirements for EFAs. Advocates of hempseed oil hold that unlike flaxseed oil, hempseed oil can be used continuously without developing a deficiency or other imbalance of EFAs. This has supposedly been demonstrated in a small clinical study of 14 people, where the daily ingestion of flaxseed oil "resulted in a higher proportion of ALA" in serum cholesteryl esters and triglycerides as compared with the ingestion of hempseed oil. However, the hempseed oil "resulted in higher proportions of both LA and gamma-linolenic acid" as compared with the flaxseed oil ingestion, and the conclusion talks of "only minor effects on concentrations of fasting serum total or lipoprotein lipid". ↑ "THC, Laboratory/Animal/Preclinical Studies, Anti-tumor Effects". National Cancer Institute at the National Institutes of Health. April 2014. Retrieved April 3, 2014. ↑ "Hemp-Oil Medicine". High Times. November 2013. Retrieved December 7, 2013. ↑ Callaway, J. C. (2004). 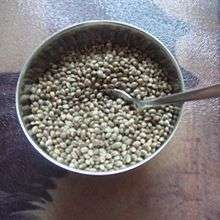 "Hempseed as a nutritional resource: An overview". Euphytica. 140: 65–72. doi:10.1007/s10681-004-4811-6. Retrieved 20 January 2014. ↑ "Hemp Oil". InnVista. November 2005. Archived from the original on September 17, 2012. Retrieved November 18, 2006. ↑ Agua Das (November 16, 1997). 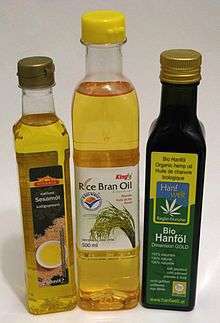 "Hemp Oil Fuels & How to Make Them". HempFarm.com. Retrieved November 18, 2006. ↑ "Hemp Farm". Retrieved November 18, 2006. ↑ Schwab, U. S.; Callaway, J. C.; Erkkilä, A. T.; Gynther, J; Uusitupa, M. I.; Järvinen, T (2006). "Effects of hempseed and flaxseed oils on the profile of serum lipids, serum total and lipoprotein lipid concentrations and haemostatic factors". European Journal of Nutrition. 45 (8): 470–7. doi:10.1007/s00394-006-0621-z. PMID 17103080. ↑ Callaway, J.; Schwab, U.; Harvima, I.; Halonen, P.; Mykkänen, O.; Hyvönen, P.; Järvinen, T. (2005). "Efficacy of dietary hempseed oil in patients with atopic dermatitis". Journal of Dermatological Treatment. 16 (2): 87–94. doi:10.1080/09546630510035832. PMID 16019622.